What is another word for unpleasant? un-plez'ant, adj. not pleasant: disagreeable.-- adj. UNPLEASABLE (- pl[= e]'), not to be pleased.-- n. UNPLEAS'ANCE.-- adv. UNPLEAS'ANTLY, in an unpleasant manner: disagreeably.-- ns. 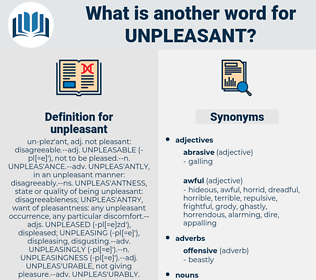 UNPLEAS'ANTNESS, state or quality of being unpleasant: disagreeableness; UNPLEAS'ANTRY, want of pleasantness: any unpleasant occurrence, any particular discomfort.-- adjs. UNPLEASED (- pl[= e]zd'), displeased; UNPLEASING (- pl[= e]'), displeasing, disgusting.-- adv. UNPLEASINGLY (- pl[= e]').-- n. UNPLEASINGNESS (- pl[= e]').-- adj. UNPLEAS'URABLE, not giving pleasure.-- adv. UNPLEAS'URABLY. regrettable, disappointing, upsetting, disgusting, difficult, troublesome, appalling, abhorrent, sordid, troubling, disruptive, negative, grim, terrible, tough, rude, harsh, creepy, frustrating, adverse, offensive, dreadful, stressful, lamentable, abominable, onerous, loathsome, odious, inclement, shocking, boring, arduous, agreeable, disastrous. uncomfortable, unpalatable, distasteful, unfortunate, unsavoury, inconvenient, unwelcome, painful, unhappy, embarrassing, annoying, obnoxious, objectionable, undesirable, untoward, uneasy, awkward, ugly, unsatisfactory, bad, awful, distressing, disturbing, repugnant, sad, tedious, tiresome, bitter, off-putting. delicious, acceptable, friendly, good, great, happy, wonderful, helpful, palatable, delightful, agreeable, pleasing, nice, tasty, kind. enjoyable, idyllic, beautiful, kindly, jolly, cheery. It gave Trix an odd feeling of unpleasant mystery. It was, from every point of view, an unpleasant one.